In the opinion of industry experts, plans to restart domestic production of legendary ZiL limousines for state officials would be feasible only with the cooperation of foreign automakers. Others, however, say Russia can tackle the job itself. A debate among Russian car enthusiasts has been raging ever since President Vladimir Putin threw down the gauntlet in April, ordering that "all state and municipal government agencies…should in the very near future" buy only vehicles produced within the Common Economic Space. While some analysts are confident that Russia can build a reliable line of limousines for its government officials, others say the effort would be a waste of government funds given present realities. "Without involving foreign automakers it is currently unrealistic to implement the project to build limousines in Russia," Oleg Datskiv, the director of auto-dealer.ru, told Interfax. "Producing limousines was necessary during the time of the Iron Curtain in the Soviet Union. Why do this? It will break down and malfunction like before," Datskiv said. It makes more sense and is cheaper to buy automobiles for officials in other countries such as Germany than to spend billions of dollars launching such a project in Russia, he added. President Vladimir Putin presently gets around town in an armored Mercedes S600 Guard Pullman, with an estimated price tag of US$1 million. Meanwhile, Sergey Udalov, the executive director of the Avtostat agency, criticized efforts to jumpstart domestic limousine production on the grounds that it would be too expensive and labor intensive. “The development of a design from scratch…and setting up serial production is a very labor intensive and expensive project," Udalov said. Yet another skeptic of plans to revive the iconic state limousine is Igor Morzharetto, deputy editor of Za Rulem car magazine. “Building a limousine from scratch is not very advisable – the vehicle will cost billions of euro, but the design will still be developed by the Italians, while the Germans will provide the engine as well as the engineering,” added the deputy editor. Not everybody, however, is so pessimistic about Russia’s ability to restart design and production of limousines. 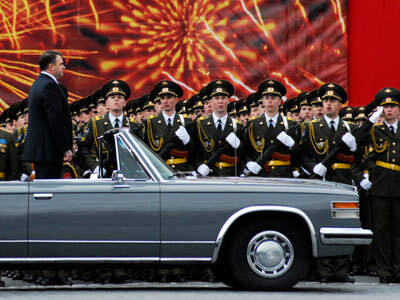 Mikhail Ganelin, a Troika Dialog analyst, expressed confidence that ZiL, producer of the famous ZiL limousines, could revive production with "a little effort." In light of the "substantial modernization" of Russia’s automobile industry since the collapse of the Soviet Union, “it is possible to use existing technology” to construct a state-of-the-art limousine, Ganelin said. Meanwhile, sources for Kommersant, a Russian daily, agreed that the project could be handled by either the ZiL auto plant or GAZ group. "They have the Chaika and ZiL brands, which could easily be revived," the paper quoted one source as saying. Finally, Sergey Sokolov, CEO of Depo ZiL, may have the last laugh among industry experts. The project for a domestically-made limousine, dubbed 'Monolith,' features a Russian-made 400-horsepower engine, together with a US-made transmission. Sokolov said the vehicle, which is designed to compete with luxury powerhouse brands like Maybach and Rolls Royce, will retain all the “iconic features” of the original ZiL limousine, while adding modern creature comforts based on state-of-the-art developments. Depo ZiL, a separate venture from the original ZiL, specializes in the repair and service of luxury vehicles.